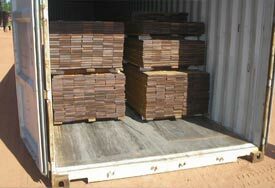 We work with mills throughout South America to secure the best possible prices on Ipe Decking. If you need wholesale quantities of lumber please contact us today! Above: Container being loaded in Brazil for delivery to Advantage Lumber in Buffalo, NY. 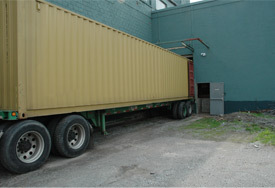 Above: Container being unloaded at our Advantage Lumber location in Buffalo, NY. We are direct importers of the highest quality exotic decking, lumber, & flooring. We have contacts with lumber mills throughout South America as well as Brazil. Our direct contact with these lumber mills allows us to offer wholesale pricing to our customers. We also have the ability to set up delivery of full container load shipments. Please contact us today if you have any wholesale inquiries regarding Ipe Decking, Ipe Flooring, or Ipe Lumber.